Extended Producer Responsibility legislation in Peru, where manufacturers pay into a recycling system to ensure that products are safely recycled, has given rise to an emerging formal electronics recycling sector. At Peru Green's recycling facility, products are dismantled at workstations (left) and materials are sorted into giant bins. 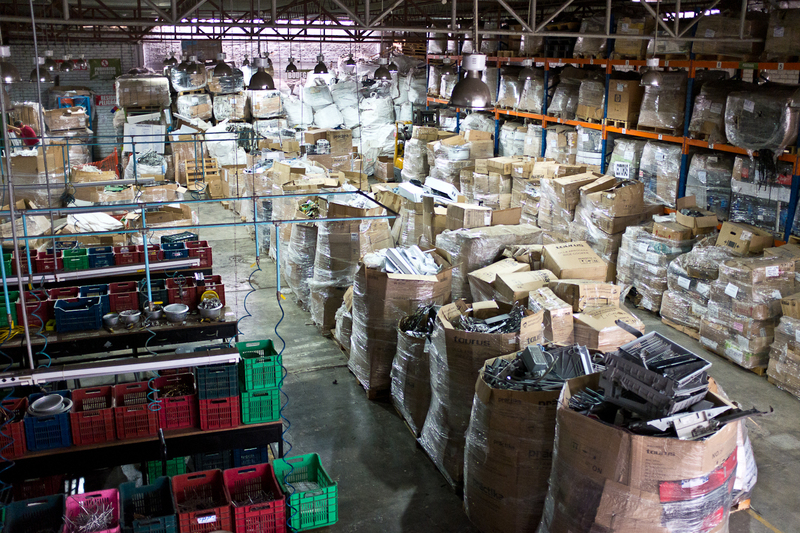 A small percentage of components are sold to a local metals processor. The majority of components, such as printed circuit boards and copper cables, are shipped to either the U.S., Europe or China for further processing since Peru Green does not currently have a mechanism for further reducing or shredding components down to their commodity, or raw material, level. Peru Green's recycling contracts with institutions prohibit reuse, thus incentivizing exports of components to regions where they have high market value. In Peru, a less industrialized country, formal recyclers have limited options for processing components beyond dismantling them, highlighting the need to shore up transparency and certification schemes for recyclers across all industrialized and non-industrialized markets.